Luxury medical spa destination, Hela Spa and renowned celebrity hair stylist, Ted Gibson are joining forces to create the ultimate experience in beauty with the opening of Hela’s flagship spa at The Collection at Chevy Chase, Washington, D.C.’s preeminent retail destination. Located just ten minutes from downtown D.C., Hela Spa’s newest location is nestled between luxury boutiques like Gucci and Ralph Lauren. Dedicated to delivering the best experience in medical aesthetics, Hela Spa brings an approach that is resolutely people centric and always puts the clients’ interests first. 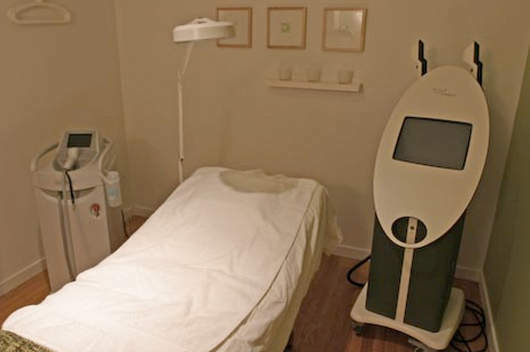 Hela, which in Swedish means “to make whole”, was established in 2002 with the opening of the Georgetown location and has since become DC’s leading medical spa. Bringing together the results-oriented treatments and expertise of a medical spa with the luxurious, relaxing feel of a day spa, Hela Spa uniquely offers spa-goers the best of both words. Partnering with reputable John Hopkins trained surgeons gives Hela the edge over other medical spas in many ways, including the delveopment of treatments pre and post surgery. Medical spa treatments offered include Botox® and Restylane® injections, Visia™ digital skin analysis, and Latisse™ eyelash treatment. Hela’s Swedish roots are reflected in the décor of the spa in addition to facials and massages with names like the “Greta Garbo” signature facial or “The Stockholm” Swedish massage. Keeping up with the latest spa trends, Hela also has a Baby Spa on-site offering infant massage instruction and pre and post-natal massage. Now, with the addition of a full-service Ted Gibson hair salon, Hela Spa @ The Collection also provides the best in hair service. Ted Gibson’s work can be seen on the runways of Prada, Chanel and Dolce and Gabana, as well as on the most recognized faces in the world such as Angelina Jolie, Renee Zellweger, Demi Moore, Gabrielle Union, and Joy Bryant, to name a few. Hela Spa and Ted Gibson have partnered with the leading brands in both skin and hair care, offering products from L’Oréal Professionnel, the premier line of hair care products, SkinCeuticals, the leaders in medical professional skincare, and botanical hair line Phyto. Each brand has been truly incorporated into Hela Spa, L’Oréal Professionnel with a specialized Hair Color Center, SkinCeuticals, the spa’s marquis skincare brand, with its own “shop in shop” and signature spa treatments, and the very first Phyto HairSpa™, offering hair and scalp analysis and an exclusive treatment menu.